For this month’s Indie Spotlight, Raelee Chapman chats with Juan Rader Bas, who describes himself as a Fil-Am Kicking Scribe (Filipino-American, martial arts devotee & writer). 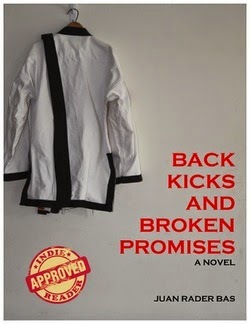 Juan Rader Bas’s debut novel, Back Kicks and Broken Promises, was self-published with Abbott Press. It is a coming of age novel about an adopted 17-year-old Filipino who finds self-expression and fulfilment through martial arts after moving from Singapore to New Jersey. Juan took time out from his busy schedule as a public school teacher, parent, martial artist and writer to discuss the indie process and his new writing projects. What was the inspiration behind Back Kicks and Broken Promises and how long did it take to write and publish? I started Back Kicks and Broken Promises - a semi-autobiographical work of fiction - in the early 2000s. I moved to the US from Hong Kong in 1985 when I was sixteen and by 1999 the family members I'd come to America with were living their own lives in other parts of the world. I was alone for the first time in my life and fending for myself, living in New Jersey, pursuing a writing career while teaching middle school and practising Taekwondo. So, in a way, Back Kicks was my own form of therapy; a catharsis, perhaps, for me to discover who I was and a springboard for me to forge ahead in my life in America. Many of the scenes in Back Kicks are either taken from things that I’ve been through or things that were said to me or I said to people. In some ways, writing about those things was a way for me to find meaning and understanding in them. Back Kicks and Broken Promises took about ten years to write and publish. Why did you choose Abbott Press to self-publish and what levels of support does Abbott Press offer in terms of editorial, cover design and layout, marketing and industry connections? I’d gotten some good responses from agents. A few of them, on hearing my pitch, immediately compared it to Junot Diaz’s Pulitzer winner, The Brief Wondrous Life of Oscar Wao. I’m very proud about that. Not only was my book spoken of in the same breath as a Pulitzer winning novel but, on some level, it’s a nod to the value of the immigrant’s story from New Jersey. Anyway, even with the good feedback, none of the agents bit. I contemplated pitching to more agents but, on some level, I also wanted to put some closure on this book and get it out there and, hopefully, it’s serving as a good calling card for my work. I chose Abbott for two reasons: It was a new imprint and I felt that since I was starting a new endeavour a new imprint might be a good way to go. Also, it was, at the time, the self-publishing press of Writer’s Digest Magazine so, as a print-on-demand press (POD), the connection to such an esteemed publication would give it some credibility compared to some other POD presses. Abbott has a full service staff that can help with all of the publishing needs an author has. The more expensive the package, the more you get. Marketing, though, is something I felt Abbott lacks. They have products you can buy and packages that include access to outlets (internet and press release distribution to industry markers) but they don’t do any actual marketing or promotion for you. Personally, I didn’t have a large budget for promotion so I couldn’t have taken advantage of what Abbott had to offer anyway. Moreover, I couldn’t do a lot on my own either. So, that’s one thing I’ll advise future indie authors on. We, as writers, get caught up in writing the book and getting it published but we often forget about the next step – promotion – thinking it’ll take care of itself. Really, it doesn’t. Even in traditional publishing, unless you’re J. K. Rowling or Stephen King or Stephanie Meyer – you’re going to be doing a lot of your own leg work in the promotion department. Back Kicks and Broken Promises spans settings in Singapore, the Philippines and America and includes other mixed race Asian-American characters – who would you say your target audience is for this book and how did you set about reaching them in terms of marketing and utilising social-media? As far as my target audience, it was really two groups: non-Asians who’re interested in Asia and fellow Asian-American mixed race immigrants. Regarding the first group, I wanted to write something that they’ll enjoy but also learn from. For instance, when I first came to America, I was asked incessantly “What are you?” and “Where are you from?” Being of mixed race, my looks can confuse some people so I always had to define myself. When people find out I’m a martial artist, many often think I can do the superhero stuff in the movies. I wanted to write something that would show them the truth behind some of these things. For the second group, I want to reach people like myself who’ve felt displaced and misplaced as a result of moving to a new country or because they’re having a hard time reconciling what they are because they are mixed. If Back Kicks, or a book like it, had been around when I left Hong Kong, I might not have felt so displaced and misplaced when I got to America. As far as using social media to reach my audiences, I set up Twitter and Facebook pages. There’s one for Back Kicks and Broken Promises on Facebook and I have a Twitter account, which I set up, quite simply, to connect with other writers and to promote my work. It’s @JuanRaderBas. I also joined a few groups like the Independent Authors’ Network, became a Goodreads author and have been a member of The Asian American Writers Workshop. AAWW is the main network through which Asian American writers can take workshops, and attend social events. It also runs the annual Asian American Literary Award. I was invited to submit Back Kicks but it turned out that my book was ineligible when they found out it was self-published as a POD book. If it had been printed through a small press, they would’ve accepted it. Additionally, through my online activity, I also connected with Hyphen Magazine in which Back Kicks was reviewed for its online edition and for which I was interviewed for its print edition. Hyphen is the main culture, arts and social magazine for Asian Americans in the US. Do you have any plans to offer your book in translation in Asian languages or is this an indie path that is more difficult to pursue? This is a fantastic question and something I’d love to pursue. Honestly, I never really thought about it before. Seriously, I’d love to get it translated in as many languages as possible but logistically, financially that is a challenge for an indie author. If it were to happen, though, I think Tagalog, Cantonese and Korean would be my first choices. What are your top tips for aspiring indie writers? Well, like I said before, have a promotion budget and make sure you have a plan in mind for that and not just the writing and publishing of your novel. Also, make sure you investigate between a print-on-demand publisher and a small indie press through which you can get 100, 200, 1000 copies of your book. You see, my book, which I thought would retail for around US$20 as a hardcover retails for almost US$40. The POD publisher sets the price and it’s because books are printed as ordered. If I’d gone small press and, say, printed 500 copies, I could’ve gotten a lower retail price and, perhaps, sold more books. Lastly, on the same topic, many bookstores are wary to carry POD books. Some are wary to carry small press books, too, but they’re less nervous about selling those than PODs. What are you working on now? Have you found agent? Would you consider the self-publishing route again in the future? I haven’t secured an agent…yet. My latest novel Sky Warrior is in submission. It’s a YA fantasy story with Chinese-American protagonists and set in the San Francisco Bay & China. There’s Kung Fu action and mythical beings and magic like the old Hong Kong movies I grew up watching. I’m really hoping that I don’t have to self-publish again. I really want to be in a position someday where I’m a full time writer. But, if I do self-pub again, I’ll investigate and use a small press and not a POD for the reasons I gave above. Do you belong to a writers group that supports you as you draft and redraft your work? I have taken workshops through The Gotham Writers Workshop in NYC, and it was through those writing groups that I got Back Kicks read. Gotham is truly invaluable and it’s something every writer should experience. Through Gotham, I’ve made connections with fellow writers and I’ve kept in touch with several long after the workshops ended.